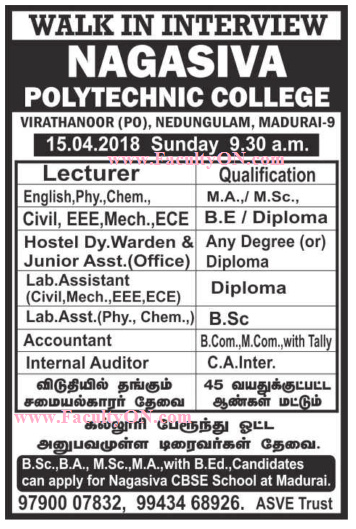 Nagasiva Polytechnic College, Madurai has advertised in the DINAMALAR newspaper for recruitment of Lecturers Plus Non-Faculty jobs vacancies. Interested and eligible job aspirants are requested to walk-in on 15th April 2018. Check out further more details below. About College: Nagasiva Polytechnic College was established in the year 2007. It is located at Nedungulam Village, Madurai district. It is running under Alagiya Sunthari Venkateswari Educational Trust (ASVET), where Prof.K.Namasivayam is the Managing Trustee and Mr.M.Nagalingam is the Joint Managing Trustee and Executive Trustee.Nagasiva Polytechinc College is run by Chairman Mr.M.Nagalingam and Vice Chairman Prof.K.Namasivayam.